Not to be confused with Dark Land. The overworld map of the Dark Realm. The Dark Realm, or the Underworld, is the second of the two realms of Jewelry Land in Yoshi's Safari. It contains five levels, which have a darker, more mystical theme to them. 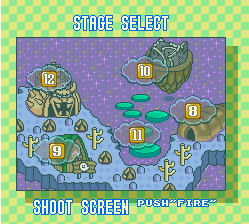 Once all of the levels are cleared, Bowser's Castle appears. This page was last edited on May 28, 2018, at 10:44.